Vienna Travel Planning. Ever imagined someone shaping space and time around you? Great personal travel planning is just that (in a down-to-earth way). 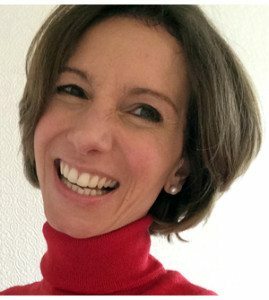 As a native Austrian and independent Austria travel planner I know the places I recommend in my trip planner and travel consultant assignments. In the past eight years I have been developing, streamlining and ‘authenticating’ trip plans to Vienna and Austria. Just as my itineraries and travel consultancy work for short trips, they work equally well for longer vacations and for round trips. To celebrate a special occasion, Andrew from the UK wanted a week packed with classical events in Vienna. Since Leiah intended to travel solo to Vienna she wanted to make sure she had lots of fun, and felt at ease when dining out. When Lisa from the UK wanted to explore the Austrian countryside following on from her Vienna city break. While researching Viennese family roots, Lois from the US found she needed help; on top shew as keen to touch base with local Viennese. Justin from the US wanted an exciting itinerary of insider things to do with his daughter. Despite booking an All-Inclusive Danube river cruise Sharon and her friends were looking for off-the-beaten-path itineraries with private guides for Vienna, Wachau Valley, Bratislava and Passau. To perfectionate his honeymoon arrangements for Vienna and Salzburg, Nelson from Hong Kong was keen to hone them with local expertise. 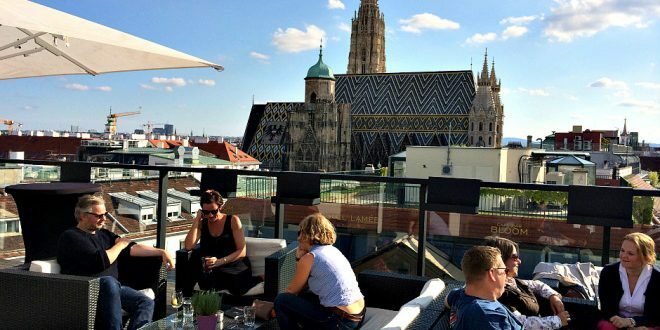 In view of her impending family trip to Austria, Jane from Singapore decided she needed a hands-on native trip planner to organise day tours and private transfers in Austria, as well as to Budapest and Prague. “Barbara, I do not know where to start, and thank you seems such a small word for an extraordinary trip. We could not have done it without you. We thought of you in Vienna, we thought of you on the train to Spitz, we thought of you in the vineyards, it was a trip of a lifetime one that I will cherish always. Neither of these travellers had the time nor the insider knowledge, language skills and local connections to do Vienna travel planning as they had wanted to. And neither of them wanted one-size-fits-all vacation packages. 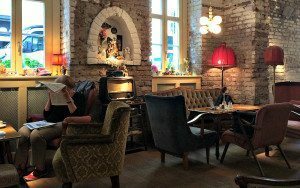 Truly, wrong choices can ruin your dream vacation: In my own case, I had so wished for a reset button when I found myself at a tourist dinner show in Spain. (Likewise, you can get this in Vienna, too.) 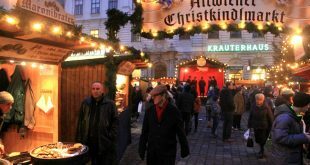 To make Vienna travel planning even more challenging, some of the best local attractions have extravagant opening hours. Equally, the best insider places remain invisible to even the most dedicated travellers. Hence, having an Austrian trip planner and travel consultant at your side will ‘authenticate’, smoothen and enrich your stay. Vienna Travel Planning. Until now the only way to get help with a trip to Austria has been to call on a travel agent or tour operator. If you are unlucky they package up mainstream tourist experiences. You may end up visiting those attractions and events that depend on tourism, and that pay hefty commissions. That’s why I share my trip planner and travel consultant service with you – the VIENNA TRAVEL CONCIERGE. I am the trip planner and travel consultant, you do the travelling. * Authentic Advice: What makes this travel planning service different to any other out there? In essence, your plan is honed by a native Viennese who is right at the pulse of her hometown. I will always tell you when I think an event is just staged for tourists. * You First. While everyone can visit landmarks, it’s harder to tell what insider gems you are missing out on. You don’t know what you don’t know. To begin with, tell me about yourself and the things you like, and you will find the Vienna that matters to you. * Extra Insight: When you hire the VIENNA TRAVEL CONCIERGE you will receive insider tips that I don’t even share on Vienna Unwrapped. * Personal hotline: Many of my clients email me additional questions as they move on. Whether just hours before or even during their trip, they always get a resourceful answer within 24 hours. Whether weekdays or weekends, it doesn’t matter. 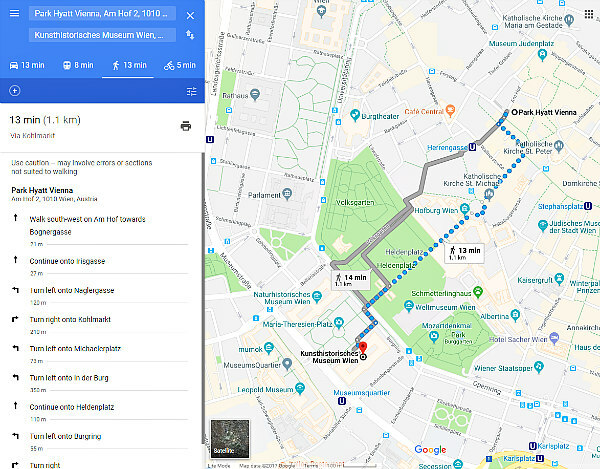 Vienna Travel Planning: How Does It Work? Talk to me over WhatsApp or Skype for more detailed specifications. Review Terms and Conditions and transfer payment. Review your personal travel itinerary. Email me your comments and I will finetune the programme until you are absolutely happy. Use the booking links to fix your programme. Need help with restaurant reservations? Let me know! Which city card will save you the most money during your sightseeing? I will assess the perfect option for you. Need assistance with finding great door-to-door transfer and out-of-the-ordinary tour guides? I can help. Use your personal hotline before and during your trip – I’m right at the other end of the line. Pack your bags, and enjoy Vienna! 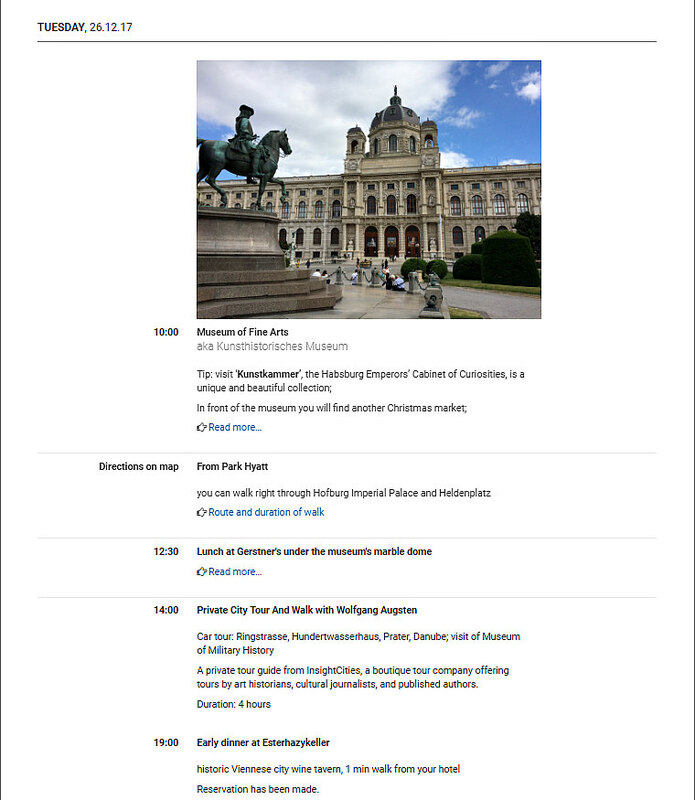 In order to give you an idea of my Vienna travel planning services here’s a sample itinerary for one day. Each day itinerary embeds practical links that connect you straight with booking pages and other relevant information. “I love your site, but don’t get the time to research all the options”, as Andrew put it. Below find a page taken from Jason’s and Kym’s 10-day Vienna programme, based on their personal trip preferences and my advice. They chose a mix of individual sightseeing and guided tours. The embedded links lead to background information and mapped out directions, keeping the itinerary neat and tidy. When onsite a simple app allows you to easily access your itinerary on your smartphone or iPad offline, along with all essential contact numbers of your hotel, transfer companies and other service providers you use. This is what a mapped out direction looks like: It doesn’t only contain a visual route but also clear verbal directions, and duration. If you prefer offline directions straight in your itinerary, just let me know. Vienna Travel Planning. Once you have discovered Vienna’s historic centre and Schönbrunn, get under the city’s skin. Where would you like to live if you could stay in Vienna? Do you care about boutique museums, town palaces, hiking and biking? How important are local markets, independent shops, quirky cafés or insider wineries to you? As a matter of fact, it’s the job of a good trip planner and travel consultant to ask the right questions. Only if those are answered, you will travel beyond the Usual. For example, right into your future favourite neighbourhood in Vienna. “My 12 year old daughter and I wanted to experience Vienna as if we were locals. On the other hand we didn’t want to miss out on major tourist attractions. As much as fun things and our own personal guide, we wanted insider eateries and gourmet restaurants. In addition, my daughter wanted to visit a few locations of The Sound Of Music in Salzburg. Given that we only had a few days to spend, we needed someone familiar with Vienna to help organize our trip. Vienna Travel Planning. When it comes to trip planning and travel consulting fees, most European travel planners charge a minimum fee of $310 for a SINGLE DAY itinerary for just 2 people (source: Condé Nast Traveler). your personal hotline for any questions around your trip. In general, this covers you for up to 6 travellers. If you’re ready to get your Vienna travel planning right the first time, just email me. In fact, I’m so confident that the VIENNA TRAVEL CONCIERGE will work for you, that I propose the following: If you don’t like the first itinerary presented, just email me your request and you will get a second itinerary for FREE. If you just need to fill gaps in your existing Vienna travel planning let me know. In that case you will receive hand-picked special insider travel tips. In essence, they will include opening hours and booking links while matching your itinerary and preferences: from restaurants, little known local attractions, concerts and other events, : $99 (up to 3 tips); $179 (4 to 6 tips). Use the email below to touch base and get the ball rolling. As independent travellers, we think we need to fix everything ourselves to get an authentic experience. But this is not the case. Therefore, connect with a Viennese like me, and commission your Vienna Travel Concierge Service today. I look forward to a no-obligation review of your trip needs and preferences!